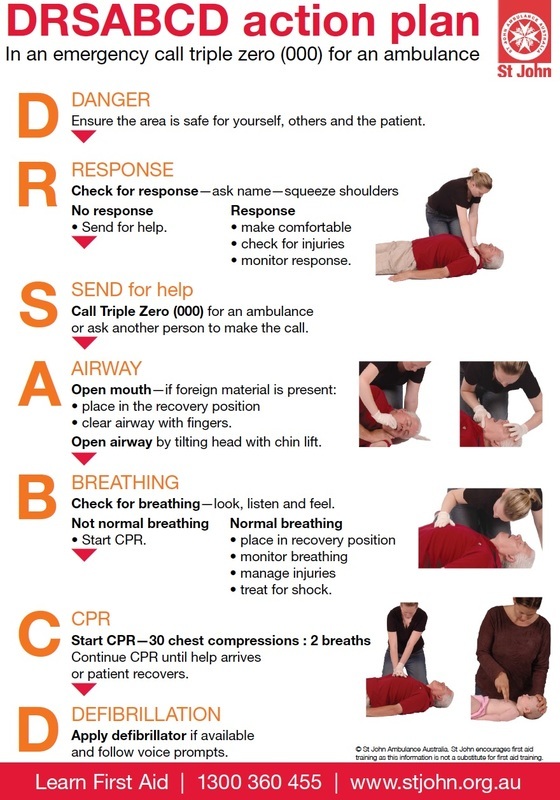 DRSABCD stands for Danger, Response, Send, Airway, Breathing, Compressions (or CPR), and Defibrillation. It's a handy way to remember the seven steps to follow when faced with an unconscious or unresponsive patient. The DRSABCD procedure lets you assess whether the patient has any life-threatening conditions, and whether immediate first aid is required. Danger: Check for danger to yourself, the patient, and bystanders. Don't put yourself in danger while assisting. Response: Check for response by talk and touch. Try to determine whether the patient is conscious. Send: If unresponsive, send for help by calling emergency services or asking bystanders for assistance. Airway: Open the patient's airway and ensure it is clear. If not, roll patient onto their side and clear the airway. Breathing: Check breathing. If patient is not breathing or breathing is abnormal, commence CPR. CPR: Give 30 chest compressions followed by 2 rescue breaths. Pinch patient's nostrils closed and breath into the mouth. Defibrillation: Attach an Automated External Defibrillator (AED) as soon as possible and follow the prompts. 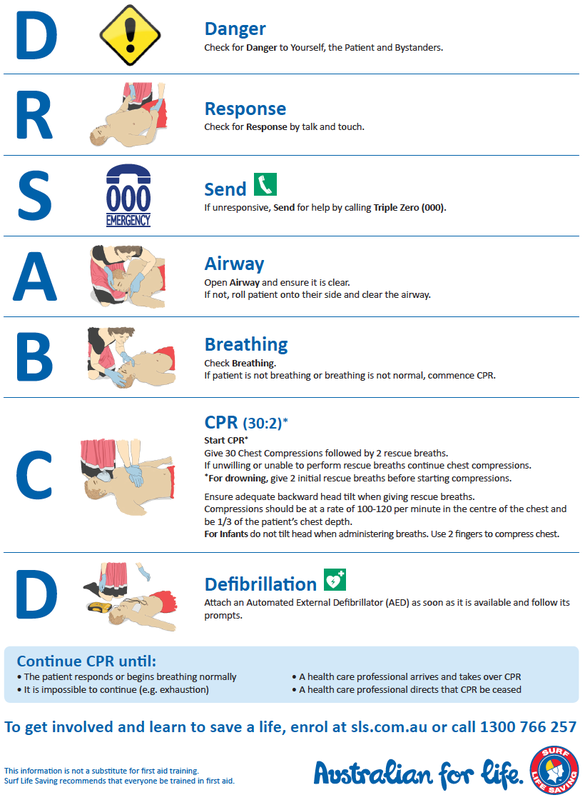 CPR should be performed until more advanced personnel arrive or normal breathing and responsiveness returns. In an emergency, any CPR is better than no CPR at all. The charts below describe the process. The first chart is from Surf Life Saving Australia and the second is from St. John Ambulance. While new research and guidelines aim to continually improve and refine the process, Cardiopulmonary Resuscitation in some form has been around for hundreds of years. In 1740, the Paris Academy of Sciences officially recommended the use of mouth-to-mouth resuscitation for drowning victims. In 1891, Dr Friedrich Maass performed the first documented chest compressions on a human. And in 1904, Dr George Crile performed the first American example of closed-chest cardiac massage. In the 1950s, Dr James Elm and Dr Peter Safar proved the effectiveness of the technique, highlighting its advantages over other emergency responses, and showing that expired air was sufficient to maintain adequate oxygenation. Safar further popularised the procedure around the world when he published the “ABC of Resuscitation”. In 1957, the US military adopted mouth-to-mouth resuscitation for reviving unresponsive victims, and in 1972, Leonard Cobb held the world’s first mass CPR training program in Seattle, demonstrating the technique to more than 100,000 people over two years. During the 1990s and 2000s, the focus has been on improving methods and spreading awareness through organisations such as the International Committee on Resuscitation. In the 1990s, Early Public Access Defibrillation (PAD) programs were developed to provide training and resources enabling members of the public to assist in the resuscitation of cardiac arrest victims. CPR has already saved millions of lives over the years, and as recognition of its effectiveness grows, many more will be saved.